(Brad Davis/The Register-Herald) The view of the Beckley-Raleigh County Convention Center from the upper parking lots Thursday evening. 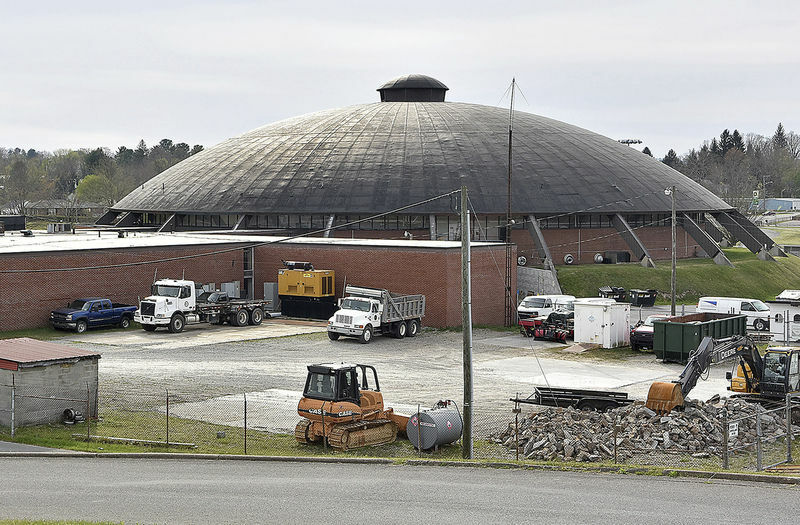 The Beckley-Raleigh County Convention Center is 36 years into the 25-year lifespan of its roof, officials said Thursday. “Those roofs are just supposed to last 25 years, so it’s time for some maintenance,” Convention Center Board Member Terry Miller said. “You can imagine the size of the roof on the dome and that’s a big deal. Bids are being gathered to replace the dome. A bid was supposed to be put in Thursday evening, but the bid amount has not been released yet. Concerned local citizen Pete Torrico says he would like to see a structural study done because of the building’s age. “There hasn’t even been a structural study, but Dave McClure and myself have been trying to get a study done. There has never been a study,” Torrico said. Miller said he would support a study and that they are now accepting bids for the roof-rebuild. As Miller mentioned, there were rumors flying around Thursday evening that the arena had been condemned and that the roof was deemed a hazard. Both Torrico and Miller said that is just a baseless rumor that was caused by the search for roofing bids. The Convention Center, formerly know as the armory, was built in 1962 to house the West Virginia National Guard’s 150th Armor Regiment. The 150th moved out of the Beckley armory in the 2006 to its current location in Glen Jean.